What Impacts Workers' Optimism About the Future of Work? 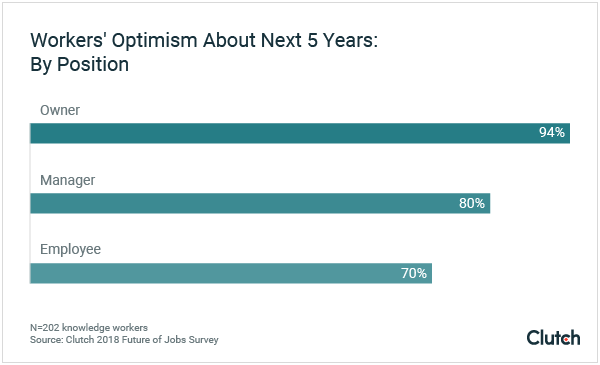 As workers reflect on the next five years of their careers, many feel optimistic about what the future holds. However, factors such as the 2008 financial crisis, gender, status within a company, and mastery of critical thinking skills have a measurable impact on their outlook. The future of work promises to transform the way we do our jobs. Technology and cultural norms alike are shifting, and job opportunities and valued skills are changing accordingly, too. 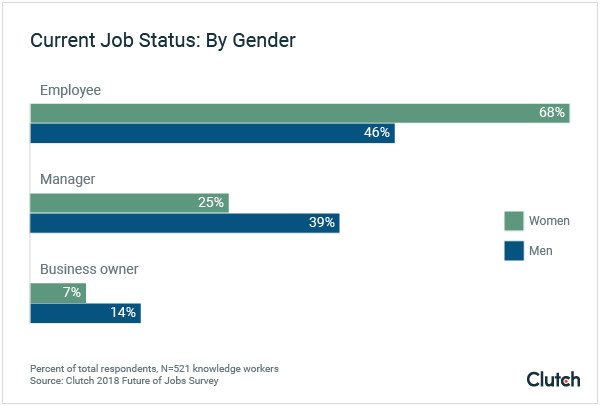 We surveyed 521 knowledge workers to learn about how changes such as changing gender roles, job opportunities, and professional development opportunities will affect their career prospects over the next five years. Overall, workers express optimism about their future careers. However, key factors such as their status at a company and gender can affect their outlooks. Additionally, critical thinking skills, including problem solving and adaptability, may be more highly valued than digital or technical skills. You can use this report to understand how these key factors impact workers’ optimism about the future of work. More than three quarters (76%) of workers feel optimistic about the next five years of their careers. One in five (20%) workers feel worried about their future career prospects. The workers most likely to be optimistic about the next five years of their careers are business owners (94%) and managers (80%), compared to a lower percentage of employees (70%). Only 10% of workers identify politics, such as changing gender roles, as potentially having an impact on their future work opportunities. More than a quarter (27%) of working women feel worried or neutral, compared to 20% of men. Men are significantly more likely to hold leadership positions (53%) compared to women (32%). Workers and hiring managers alike value soft skills such as problem-solving and adaptability more than digital or technical skills. More than a third (40%) of employees rank critical thinking skills most highly, compared to only 14% who prioritize digital or technical skills. Among the workers we surveyed, the majority are looking forward to what their future careers hold. More than three-quarters of workers (76%) express optimism when reflecting on their careers and professional development over the next five years. Among knowledge workers, defined here as or part- or full-time employees who can do their jobs from a desk, optimism outweighs feelings of fear or anxiety about the future. As the Executive Director of Gordon College’s Master of Science in Financial Analysis, Alexander Lowry helps students prepare to enter the business world and coaches executives at the companies where they might work. In his work, Lowry noticed that the 2008 recession still affects how many workers perceive future opportunities. “The job prospects are wildly different now compared to before,” said Lowry. For example, a worker who looked for a job shortly after the financial collapse would be likely to feel more optimistic today, given the extent of the U.S. economy’s recovery. "The job prospects are wildly different now compared to before." For Sasha Kildare, a technical writer who recently lost her job at Wells Fargo during widespread layoffs, it’s become easier to feel optimistic about the future. Following her layoff from Wells Fargo, Kildare received severance and the opportunity to stay on as a contractor for short-term projects – two post-layoff benefits that would not have been available a decade ago. Still, it’s also important to note that 20% of workers feel worried about the future. Although workers’ views might seem paradoxical, the report corroborates our finding that workers tend to feel optimistic when considering their own career outside the context of larger political, economic, and social forces. Lisa Holmes is an HR executive who currently serves as Chief Business Strategist at Strategic Performance of Los Angeles. She also notices a major shift in job opportunities and the hiring process after 2008. Today, Holmes’ clients experience job searches that are lengthy and competitive, while employers often begin recruiting with less clearly defined roles. Although job searches have become more challenging, the lack of clarity around available roles can create opportunities for nontraditional candidates. Job seekers who have a strong personal brand, advocate for their ability to transfer skills and work experiences, and are open to changing industries tend to be most successful. For example, Kildare plans to parlay her experience as a technical writer into freelance journalism, teaching, television writing, or working on a combination of projects. Over the years, she has accumulated work experiences, online coursework, and certifications that allow her to qualify for opportunities in multiple fields. Overall, past experiences and personal capabilities can impact workers' outlooks about their future career prospects. A company's decision makers and individual contributors have different perspectives about their future career prospects. Our data shows that decision makers, including business owners and managers, tend to be more optimistic compared to other employees. Nearly all business owners (94%) are optimistic about their future career prospects, while 80% of managers are optimistic. By comparison, significantly fewer employees (70%) express the same optimism. Business owners and managers are more likely to have seniority and experience: Their specialized knowledge may provide greater job security. Specifically, they tend to shoulder greater responsibility accompanied by perks such as higher pay and a greater sense of control over daily tasks at work, which can reduce the effects of burnout. Holmes points out that business leaders often enjoy a greater variety of daily tasks and the opportunity to create strategies that may not be fully communicated with employees who don’t manage other colleagues. “The risk and reward is greater,” said Holmes, speaking from her experience at the helm of her own business. As an experienced business owner, she is free to set her schedule and take on the projects that interest her most. However, experts also point out that higher rates of optimism among decision makers may also be a case of correlation rather than causation. The optimism Lowry describes is also known as “grit,” and studies show that individuals who possess grit tend to be more successful than their peers. As business owners and managers prepare their companies for the future of work, they should be mindful that employees might have fears or anxieties about their future career prospects. Transparency and communication about plans for the future can help boost employees’ morale. Men are more likely to hold leadership positions compared to women, and this correlates with their slightly higher levels of self-reported optimism. Although the majority of both men and women are optimistic about their future careers, more than a quarter (27%) of women feel worried or neutral, compared to 20% of men. While 32% of women we surveyed hold a leadership position, more than half of men surveyed (53%) are business owners or managers. Our data aligns with other statistics about women in leadership. In 2018, Development Dimensions International (DDI), a human resources and leadership development consultancy, found that women hold only 29% of all leadership positions. Holmes approaches coaching men and women differently. In general, the men she coaches tend to be more assertive, less likely to back down from a challenge, and more confident in their knowledge. “I noticed [men] never have to seek to be heard,” said Holmes, who observed changes in her career opportunities when she adopted more competitive tactics two decades ago. When Holmes coaches female executives, she encourages them to study their fields carefully and use that knowledge to defend their opinions confidently. In 2017, Harvard Business Review completed a study of 57 women in CEO roles. The findings support Holmes’ observation that women tend to be less vocal about their expertise. Instead, women are more likely to express appreciation for teamwork – a hidden strength that can actually help businesses succeed. Despite these findings, only 10% of workers believe politics, including shifting gender roles, are the factor that will have the biggest impact on the future of work. However, research shows that businesses that prioritize gender diversity tend to earn higher profits, build more successful work processes, and build more meaningful relationships. To reap these benefits, companies should ensure that their leadership pipeline includes men and women equally. Without a clear picture of what future jobs might demand, hiring managers and employees alike value transferrable, non-technical skills. 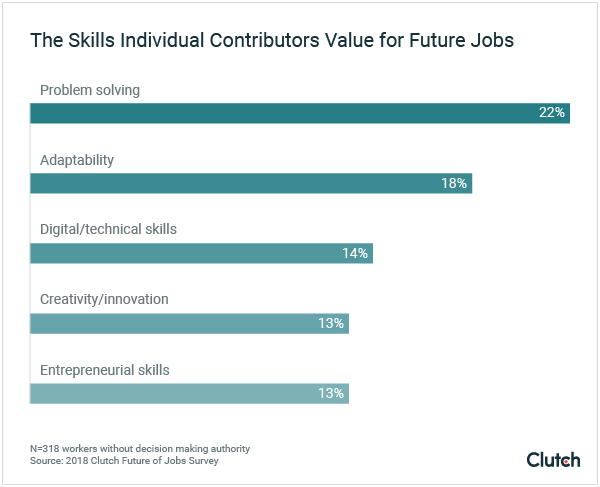 Decision makers and individual contributors alike believe critical thinking skills, including problem solving and adaptability, are the most important skills for the future of work. In fact, business owners and managers are more likely to value problem solving (13%) in future employees, compared to digital or technical skills (8%). Similarly, employees highlight their problem solving and adaptability skills when applying for jobs. More than a third (40%) of employees rank critical thinking skills most highly, compared to only 14% who selected digital or technical skills. Critical thinking skills can be easily transferred and applied to future jobs, while digital or technical skills may be be less easily transferrable depending on companies' specific processes, tools, and needs. As he helps students at Gordon College prepare for their careers, Lowry encourages his students to reflect on the type of company they hope to join. This can help inform which skills they should prioritize. For example, startups might require a technically skilled workers prepared to use software or coding skills, while large, traditional corporations might be more interested in a new hire’s ability to learn their proprietary systems. Holmes’ advice resonates with this approach. “If you can’t make the financial impact that you need to make in an organization, you will quickly be replaced,” she coaches. Additionally, Holmes points out that as career paths have become less clearly defined, hiring managers are more likely to weigh a candidate’s skills rather than their specific title or position in a previous role. Workers who consistently align their skills with their organizations’ definitions of success are more likely to be valued by their companies. In addition to building new skills, workers can learn how to apply the skills they already have to new situations. As Kildare prepares to enter the job search once again, she is reflecting on her strengths, skills, and interests. “You have to step back and figure out what you like to do and what you’re good at,” said Kildare. This approach can help workers think creatively about which job opportunities they might qualify for, even if it means changing industries. Although the majority of workers feel optimistic about their future careers, a significant number feel worried that future opportunities may be limited. Men working as business owners or managers are more likely to be optimistic about the future than women, who are less likely to feel confident or hold a position with decision-making authority. Although the future of work will be significantly affected by changes in technology, significantly fewer workers believe digital or technical skills will be the most important factor in their future career prospects. Instead, workers tend to prioritize critical thinking skills including problem solving and adaptability. By striving for gender parity and helping workers develop needed skills, companies can help prepare the workforce for future changes. Clutch surveyed 521 knowledge workers about their outlook on the future of jobs. Respondents work in traditional offices (75%), at home (19%), in a coworking space (12%), or at a public space such as a library (3%). The majority of respondents are employed full-time (85%), with the remainder employed part-time (15%). A range of industries were represented, including business/legal/financial services (19%), healthcare/life sciences (17%), education (16%), IT/telecommunications (12%), government (11%), retail/hospitality (8%), advertising/marketing (5%), and miscellaneous other (12%). Respondents came from all regions of the United States: South (40%), Midwest (23%), Northeast (22%), and West (16%). Women (70%) and men (30%) were included in the survey. Respondents ranged from millennials aged 18-34 (42%), Generation X aged 35-54 (44%), and baby boomers aged 55 and over (15%).